At an Awards Gala held by the North Vancouver Chamber Of Commerce last week, Thomas FX was named the 2014 Business Of The Year. We thank the Chamber of Commerce, Judges, and Sponsors, for this prestigious and unexpected Honor. 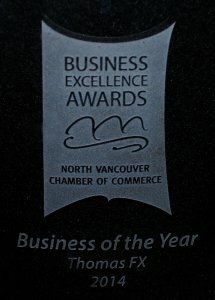 In 2004, Thomas FX received a Business Excellence Award from the North Vancouver Chamber of Commerce for Business Innovation.